MANILA, Philippines, December 24, 2009 (ENS) – Mount Mayon, the Philippines’ most active volcano, is shooting columns of ash more than a kilometer above the summit and red hot lava is “fountaining” to a height of 500 meters – signs that an eruption is imminent, national volcano officials said today. Phivolcs, the Philippine Institute of Volcanolgy and Seismology, has been warning for days that the volcano might erupt at any time and raised the alert level to 4 on Sunday. Level 4 means that a hazardous eruption is imminent and the maximum alert level 5 means an eruption is occurring. Located in the Bicol Region, Albay province on the island of Luzon, the Mayon volcano has erupted 49 times in the past 400 years, most recently in 2006. Loud rumbling sounds and more than 700 hundred tons of sulfur dioxide a day are filling the air around the mountain and lava is observed continuously flowing down along the Bonga-Buyuan, Miisi and Lidong gullies. Phivolcs’ seismic network has detected 815 volcanic earthquakes under the mountain to 4pm Wednesday. Ash and debris from the volcano is already covering surrounding villages and towns with a thin layer of fine particles that health officials caution could cause respiratory and skin problems. Phivolcs has designated the area eight kilometers (five miles) on the southern side and seven kilometers on the northern side of the mountain as an Extended Danger Zone that must be free from human activity. In response, officials have evacuated 47,137 residents from around the base of the volcano. At the presidential palace in Manila, Executive Secretary Eduardo Ermita told reporters that 9,880 families have been moved to temporary shelters after the volcano showed signs of imminent eruption. The evacuees are now housed in 26 school and other government buildings in the cities of Legaspi and Tabaco and three nearby towns. On Wednesday, President Gloria Arroyo flew from her vacation in Hong Kong to Legaspi to oversee the distribution of foods and other basic necessities to the evacuation centers. Military and police personnel have donned Santa hats in an attempt to bring Christmas cheer to anxious children far from home this Christmas Eve. Later, Albay Governor Joey Salceda, chairman of the Provincial Disaster Coordinating Council, told the President that the number of solders and policemen patrolling the area around Mayon Volcano has been doubled to ensure that everybody is moved to safer grounds and nobody is allowed to go within the danger zone. Phivolcs is warning that areas just outside of the Extended Danger Zone should prepare for evacuation in the event hazardous explosive eruptions intensify. 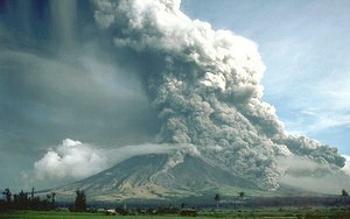 There is also a risk of ashy mudflows or landslides called lahars if rainy weather follows an eruption. “Active river channels and those perennially identified as lahar prone in the southern sector should also be avoided especially during bad weather conditions or when there is heavy and prolonged rainfall,” warned Phivolcs. 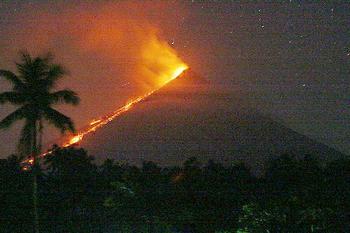 Mount Mayon is part of the Pacific Ring of Fire like other volcanoes located around the rim of the Pacific Ocean.